Dog Parks in St Augustine, Florida! We research great places to go with your dogs in St Augustine! Please see our pet parks interactive map. The most obvious choice for a dog-friendly activity in St. Augustine is a trip to the beach! 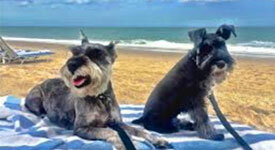 Canines are allowed on all of the beaches in St. Augustine, except for Anastasia State Park. Dogs are required to stay on a leash. Vilano Beach, Crescent Beach, Fort Matanzas National Monument, Frank Butler County Park, North Beach. Videos! Cozy and shaded dog park with friendly locals and fresh water, mulch ground cover, and no separate areas for large and small dogs. This park has a small dog park inside, with a fenced area with water, lovely, with huge shade trees and great people. Doggy play ground with two larged fenced in areas with a pond and obstacles for pets to play. 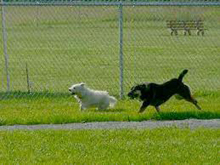 Designated parking for this Paw Park is near the football field parking lot, and there is also a dog wash station located next to the concession stand building adjacent to the southernmost end of the Paw Park. Bags and trash cans are located around the park for your convenience. **Unleash dogs in desginated areas before letting them into the park. 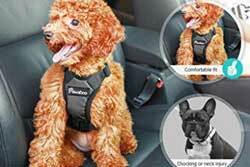 Well-behaved pets on leashes are welcome aboard! Relax and enjoy a 1 hour 15 minute cruise aboard the Victory III, narrated by the Captain, providing an incomparable way to view Saint Augustine's historical landmarks and natural sites of interest. Departs daily from the St. Augustine Municipal Marina in downtown Saint Augustine. Take a fascinating, informative, entertaining tour of Ponce de Leon's Fountain of Youth Archaeological Park, the original site of the Nation's oldest city, located in the area first explored by Juan Ponce de Leon in 1513 and settled by Pedro Menendez de Aviles in 1565, historic St. Augustine is the oldest successful European settlement in the United States! Pets are allowed on the grounds and in the exhibits, but watch out for peacocks! From St. George Street to the Mission de Nombre de Dios, much of historic downtown Saint Augustine is an outdoor adventure, where leashed pets are welcome. Offers pet friendly tours, so you don't have to leave your pet in your room, "Bone Appetit" is a pet friendly food tour, with treats and special "Pet Stops," or try "St. Augustine Pup Crawl" where you and your dog can tour a historic pub. All tours support Ayla's Acres, a no-kill animal rescue. Link to sign up for pet friendly walking tour!